Welcome to the Middle School at Greensboro Day School where we foster the most caring, trustworthy, and joyful learning community for Middle School students. This developmental time is awkward for many adolescents as they are discovering their strengths and interests, and understanding areas where they can improve. Middle School students crave connections and we provide a safe social-emotional environment for them to develop their character and learning potential. Alongside myself is a group of professionals who believe that working with this age group is their life’s work and understand that we are all "works in progress." From instilling confidence, to giving appropriate levels of support, to challenging students to stretch past their comfort zones, GDS educators are equipped with the passion and unique skills to make middle school a turning point of each child’s educational journey. I hope that you will take the opportunity to visit us and see first-hand our unique, dynamic, and comprehensive academic environment. I would love to welcome your family to Greensboro Day School! The GDS Middle School fosters relationships of honesty, caring connections and respect. We help students become lifelong learners and ethical leaders who constructively contribute to Greensboro, the greater community, and the world. Our days are filled with students searching, creating, examining and reflecting. We are intentional in designing our academics as a compliment to the adolescent experience. It is a time of physical, emotional, and social development and discovery. Research shows that students fare better in academics as well as life overall with strong problem solving, perspective taking, and emotion management skills. These three skills are key in developing and sustaining perseverance. Our Middle School counselor provides social and emotional support, and programming for the Middle School community. Working with students in the classroom, in groups, and individually creates easy access and a comforting environment. In addition to traditional classroom learning, students are given opportunities to learn outside of the classroom in stimulating environments that promote personal growth, team building, group cooperation, and leadership skills. Research shows that for students to learn at their potential they need to feel deeply cared about and connected to the teacher and the classroom community. We focus on building relationships and social-emotional skill development featuring emotion management, perspective taking, and problem solving skills. The fifth grade English program at GDS provides students with authentic writing opportunities so they can see that the power of their words, when written or spoken correctly, impacts individuals and the entire community. Students explore literature, understand the beauty of differing perspectives, and grow as they experience the world through multiple lenses while staying strong in their own personal convictions. This course serves as a bridge between the concepts learned in Lower School mathematics and the expectations of Middle and Upper School level mathematics. Computation skills with whole numbers, decimals, and fractions will be further developed and reinforced. Students will be expected to demonstrate competency in these computations without the aid of a calculator. Students will develop an understanding of concepts through collaborative grouping, individual explorations, and application of real-life scenarios. They will integrate their study of graphs and data assessment with the topics they study in science class and apply measurement skills, conversion of units, and the principles of area and volume within the study of geometry. Algebra readiness skills are integrated throughout the course in preparation for sixth grade and beyond. through dissections, labs, projects, and work in the Andreve Teaching Garden. Students will examine the human experience through the lens of historical events and how that impacts contemporary social issues. The goal of this course is to encourage students to go beyond memorization of dates and facts to think analytically and deeply about crucial social, cultural, legal, and political implications. In order to support student thinking, reading, writing, discussion skills, and performance across all content areas, this course will also seek to develop solid study, note-taking, and organizational skills. The sixth grade English program at Greensboro Day School offers a balance of reading, writing, vocabulary, and grammar instruction. In reading, the focus is on active engagement with longer, more complex pieces of writing, both fiction and nonfiction. Students will learn to read closely and use a variety of reading comprehension strategies to analyze and evaluate texts. A shift from creative writing to expository writing occurs in sixth grade, with direct instruction in learning how to organize cohesive body paragraphs with relevant details and developed introductions and conclusions. Vocabulary and grammar skills develop within critical reading and writing experiences, with the goal of adding interest and variety to students’ writing and communication skills. Problem-solving is a foundational part of sixth grade and provides a context for developing and maintaining both conceptual understanding and computational fluency. The program continues the movement from concrete representations to abstract thinking and application of skills. Students explore and investigate new concepts in a small group setting. They communicate their understandings through written explanations and mathematical notations. Vocabulary development is an important part of each lesson. Major areas of study include algebraic thinking, equations and inequalities, fractions, decimals, percent application, proportional reasoning, graphing, and geometry. Students engage in projects, small group activities, and presentations related to various concepts. The sixth-grade science class focuses primarily on physical science, with the integration of life and earth science when applicable. The curriculum is inquiry-based and employs frequent hands-on experiments and demonstrations combined with the appropriate use of technology resources. The sixth grade continues the process of exploring the essential question of what are scientifically literate citizens. A scientifically literate citizen is an individual who has the skills and knowledge to investigate a problem, research an issue, and participate in intelligent public discourse about scientific issues that affect a community. Topics covered include scientific method, the study of the metric system (prefixes, mass, volume, density, temperature, and graphing), ocean floor topography, and field study of the natural world (farm exploration). Topics in sixth-grade global studies include world geography and culture studies. Students will learn to be global citizens with an awareness of the complexities of geographic, economic, political, environmental, and cultural situations in our world. Africa, Asia, and Oceania will be areas of emphasis. Students will also participate in a STEM project of their choice on one of the 17 UN Global Goals. In addition, they will develop leadership skills such as communication, innovation, and critical thinking. Seventh-grade English is a study of literature that seeks to understand the use of elements and devices to create characters and develop themes. Students write expository essays using their exposure to literature to help them grasp the basics of good writing. Additional emphasis is placed on vocabulary and grammar as tools to help developing writers. Advanced English provides students with a challenging curriculum. Students will use a wide variety of text to increase their use of critical thinking skills. The curriculum moves at an accelerated pace with a more concentrated focus on independent reading, writing, analysis, and problem solving. The primary goals of the course are to foster independent learning and encourage in-depth exploration of the content. Outside reading/writing assignments are a part of the course. Pre-Algebra A is part one of a two-year pre-algebra course. It is designed to review concepts and skills in arithmetic, along with related procedures which may not have been fully developed during prior years, while introducing new concepts, language, and symbols necessary for the study of higher mathematics such as Algebra and Geometry. This class will explore many of the same topics covered in Pre-Algebra AB, giving these students a similar, if less detailed, knowledge base compared to the more fast-paced AB course. For example, Pre-A students will be introduced to abstract concepts and learn to express mathematical ideas through variable expressions, equations, and inequalities. Students will practice problem-solving in both independent and group situations throughout the year which will require a working understanding of the order of operations in order to simplify expressions. They will be able to translate words to symbols (and back as needed) while gaining the ability to solve the equations and inequalities that result from those translations. The advantage of this course is that students have time to fully acquire the necessary skills, while building the confidence and desire to further their mathematical education. Pre-Algebra AB is an accelerated course in which the rules for positive and negatives are introduced and developed throughout the year. It is likely the last course students will take before Algebra I that reviews and drills fundamental operations (addition, subtraction, multiplication and division) through the use of whole numbers, as well as with integers and rational numbers. Students will be expected to practice and perform basic skills with speed and accuracy and their basic skills will be stretched to include the mastery of evaluating expressions with positive or negative exponents. During this preparation for Algebra I, students will be introduced to high-level abstract concepts and will learn to express mathematical ideas through variable expressions, equations, and inequalities. There will be some exposure to the Coordinate Plane, the Pythagorean Theorem, and other relatable topics. Students will develop strategies for problem-solving throughout the year and will learn a formal approach to setting up and solving algebra-based word problems. Seventh-grade Life Science students study the complexity, secrets, and beauty of the natural world. Students learn to identify the six kingdoms of life, the ways in which they interact and are sustained, and have an appreciation for each. Students have access to on-campus resources such as the Andreve Teaching Garden, the nature trail, and the learning pond to help them understand what they study. They exercise their new knowledge by completing a wide variety of projects that help them develop their skills of inquiry, observation, and exploration. Students study ecology, cells, genetics, the history of life, plants, animals, and human body health. The students learn to give special attention to how the worlds interact and support each other to create the web of life. Seventh-grade American studies will take an in-depth look at American history from the pre-Columbian era through the Civil War and reconstruction. Emphasis will be placed on the development of critical thinking and historical investigation through document analysis and hands-on projects and activities that allow students to experience history firsthand. The eighth-grade English course provides opportunities for learning in the following areas. Students will explore the themes of courage, empathy, and the causes and effects of prejudice in literature and writing. Grammar - Students continue grammar work in the areas of mechanics, sentence structure, and sentence composition and combining using verbals and clauses. Writing - Expository paragraphs, poetry, essays, and a speech using the writing process will be added to each student’s Writing Portfolio. Students will use the writing skills studied in class to create a seven-chapter autobiography. Literature - In addition to the reading and study of poetry, novels, and autobiographies, students will be expected to read independent reading books each semester. Vocabulary - Vocabulary will be studied using Vocabulary Workshop as well as words taken from the assigned readings in literature. Students will focus on part of speech, definition, and usage of the words especially in sentence composition. The eighth-grade Advanced English course provides opportunities for learning in the following areas. Similar to standard English, students will explore the themes of courage, empathy, and the causes and effects of prejudice in literature and writing. Students will participate in seminar discussions and other activities to delve deeper into analyzing literature. Grammar - Students continue grammar work in the areas of mechanics, sophisticated sentence structure, and sentence composition and combining verbals and clauses. Writing - Expository paragraphs, poetry, essays, and a speech using the writing process will be added to each student’s Writing Portfolio. Students will be expected to write more sophisticated essays as part of assessing their understanding of themes and ideas in the literature units. They will also use the writing skills studied in class to create a seven-chapter autobiography. Literature - In addition to the reading and study of poetry, novels, and autobiographies, students will be expected to read independent reading books each semester as well as other more sophisticated literature to enhance each unit of study. Vocabulary - Vocabulary will be studied using Vocabulary Workshop as well as words taken from the assigned readings in literature. Students will focus on how to use these words effectively in writing.. Students will focus on how to use these words effectively in writing. This course is the second part of a two-year pre-algebra course that begins in the seventh grade with Pre-Algebra A. While students in this class review computation with whole numbers, decimals, and fractions for automaticity, they extend their understandings to include operations with integers, signed rational numbers, and irrational numbers in radical form. Course work requires students to extend their use of variables and increase their algebraic documentation skills. Statistical and measurement studies are woven throughout the curriculum, which allows students to examine current data in a variety of forms, construct visual representations from data sets, and make connections among the real world and mathematics. Students explore geometric concepts in depth using a variety of media and apply their understanding of mathematics to pose and solve relevant problems. They work with manipulatives and use numerous software programs to move from concrete to abstract reasoning at a pace that permits them to develop a strong foundation while acquiring a heightened sense of confidence. As development permits, students begin an introductory study of algebra that includes writing, solving, and graphing linear equations. Course activities emphasize understanding numerical relationships, working collaboratively, using multiple representations and strategies, and building argumentation skills. This course is an exploration of real numbers and the axiomatic system of algebra. Course work requires students to extend their use of variables, examine algebraic properties, and make connections among quantitative relationships in the real world. The course focus on the Cartesian coordinate system is an in-depth study of linear equations and inequalities that includes writing, graphing, and solving systems of open sentences. Statistical studies are woven throughout the curriculum, which allows students to examine current data in a variety of forms and construct visual representations from data sets. The study of polynomials includes solving quadratic equations by factoring. Course activities emphasize understanding numerical relationships, working collaboratively, using multiple representations and strategies, and building argumentation skills. This course is an exploration of real numbers and the axiomatic system of algebra. Course work requires students to extend their use of variables, examine algebraic properties, and make connections among quantitative relationships in the real world. The course focus on the Cartesian coordinate system is an in-depth study of linear equations and inequalities that include writing, graphing, and solving systems of open sentences. Statistical studies are woven throughout the curriculum, which allows students to examine current data in a variety of forms and construct visual representations from data sets. The study of polynomials includes solving quadratic equations by factoring, completing the square, and utilizing the quadratic formula, which students derive. Course activities emphasize understanding numerical relationships, working collaboratively, using multiple representations and strategies, and building argumentation skills. Eighth-grade science at Greensboro Day School is dedicated to the study of Earth Science. The scope of this course encompasses astronomy, meteorology, and geology. Emphasis will be placed throughout the year on hands-on experiments that underscore measurement, and the collection and interpretation of real-time scientific data. American Studies in eighth grade continues the general examination of United States history beginning with post-Civil War Reconstruction. Topics covered during the year will include Industrialization and Immigration, American Imperialism, World War I, the Roaring Twenties, the Great Depression, World War II, the Cold War, the Civil Rights Movement, and concludes with modern topics in American history and culture. Time is spent using primary sources, project-based research, note taking skills, as well as class debate and discussion. The Greensboro Day School World Languages program enables students to develop the linguistic and cultural skill-sets necessary to communicate in a language other than English. We believe the study of another language is integral to realizing Greensboro Day School’s mission of developing the intellectual, ethical, and interpersonal foundations students need to become constructive contributors to the world. Please note that GDS world language courses have been correlated to proficiency levels set forth by the American Council on the Teaching of Foreign Languages (ACTFL). Fifth grade World Languages at GDS is dedicated to formally introducing students to all three languages - Chinese, Latin, and Spanish. Within our language explorations program, fifth grade students are able to reach a Novice Low level of proficiency in the areas of: speaking, reading, listening, and writing. Students develop the ability to have very basic conversations, to imitate sounds and words that they hear, to understand some commonly used words and expressions, and to connect words, phrases, and characters to their meanings. Sixth grade World Languages is dedicated to a more intensive study of one language - Chinese, Latin, or Spanish. Students are able to reach a Novice Mid level of proficiency in the areas of: speaking, reading, listening, and writing. Students develop the ability to ask and answer questions on familiar topics, the ability to express personal preferences, the ability to present simple information, and they are able to read short writings. The sixth-grade year of a language program is considered to be the first half of a Level I course. seventh grade year of a language program is considered to be the second half of a Level I course. Students will have some exposure to Level II curriculum. Eighth grade World Languages at Greensboro Day School continues to be an intensive study of one language - Chinese, Latin, or Spanish. By the end of eighth grade, students will demonstrate a Novice High level of proficiency in the areas of: speaking, reading, listening, and writing. Students develop the ability to read for understanding, expand their ability to write fuller length assignments, and are able to support their communications with primary-source materials such as graphs, texts, and audio samples. The eighth-grade year of a language program is equivalent to one year of a Level II course. Students who begin a language in the eighth grade will be placed into the one-year Level I course. *As Latin is a classical language, the focus in Latin classes is on reading and writing. The middle school art curriculum strives to expose students to a wide variety of techniques and mediums, continuing to grow on the elementary foundations set in the Lower School. Students attend art 2-3 days per week where they have exposure to art history, ceramics, photography, design, painting, drawing, computer arts, sculpture, and more. We encourage artistic growth in complexity and thoughtfulness as students progress each year, building their confidence to express themselves through art both in and out of the classroom. 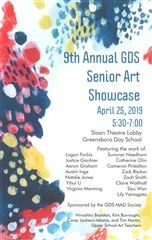 Students and parents can look forward to our two annual art shows, which showcase exceptional student work from our student body as well as opportunities to enter an array of art competitions state and nationwide. At Greensboro Day School, we believe music is an essential part of a well-rounded education. All middle school students participate in a musical ensemble 2-3 days per week, choosing between band, strings, or chorus. Students learn about rhythm, performance, creativity, improvisation, teamwork, problem solving, and much more. We offer an expanded variety of musical ensemble offerings in the Upper School that includes concert band, chorus, orchestra, jazz band, pep band, and chamber music. The Physical Education Department at GDS strives to provide students with the tools necessary to live physically, mentally, socially, and emotionally healthy lives. We believe that in order for our students to become “constructive contributors to the world”, they must exhibit personal qualities of healthy living. Middle School Physical Education classes meet three times a week for 45 minutes. Students have the opportunity to participate in team activities, functional fitness, and recreational games. They also engage in discussions and activities focused on health topics related to middle school aged students. Physical Education classes are held in our gyms, on our athletic fields, and in our weight room. Study Skills is an annual course that is offered for students who benefit from academic support beyond the help of their classroom teachers. Upon the recommendation of the Learning Specialist and Division Director, students with documented learning differences and/or recommendations from their teachers may replace their Middle School World Language requirement with the Study Skills course. During this course, students analyze their own learning styles in order to understand how this impacts their academic success. They learn techniques to capitalize on strengths and offset weaknesses. Specific skills taught include: time-management, listening skills, organization, homework completion, reading comprehension, writing process, note-taking, and test-taking strategies. Tutoring provides students with 1:1 support from a professional tutor. It is available before, during, and after school on our campus. Another option is Academic Coaching, which provides students with “coaching” in all areas that support effective learning from a qualified Upper School student. These support options can be coordinated through our learning resource specialists. Homework help is offered after school for students who need or want additional support when completing assignments. This is a fee-based service offered Monday-Thursday, and families may set their own flexible schedule. The homework help teacher supervises a quiet work environment and is available to assist students with time management and general organization. Our counselor provides social and emotional support and programming for the Middle School community. Working with students in the classroom, in groups, and individually creates easy access and a comforting environment. The Middle School Counselor is a member of the Student Support Team and advocates for students’ emotional health needs, particularly in times where academic modifications are needed to best support student success and wellbeing. The counselor also works collaboratively with faculty and administration to support student life.